Balanced scorecard (BSC) is a strategic planning and management tool which is extensively used by the organizations worldwide to align business activities to the vision and strategy of the organization, improve internal and external communications, and monitor organization performance against strategic goals. The concept was originated in 1992 by Robert Kaplan and David Norton as a performance measurement framework that added strategic non-financial performance measures to traditional financial metrics for providing management of the organization a balanced view of the organizational performance. Kaplan and Norton have described the BSC as given below. In the view of Kaplan and Norton the measurement is fundamental to the organizational management. If the organization is to improve the management of its intangible assets then it has to integrate the measurement of the intangible assets into the management system. The concept explain that if the managers can measure what they say and express it in numbers then they know something about it. But if they cannot measure it and cannot express in numbers then their knowledge of the subject is very limited and unsatisfactory. The concept is based on principle that the things cannot be improved unless they are measured. Though the ‘balanced scorecard’ phrase received its popularity in 1992, but this type of approach was followed even earlier by many organizations. Several organizations have used systems consisting of a mix of financial and non-financial measures to track progress for quite some time earlier than 1992. One such system was created by Art Schneiderman in 1987 at Analog Devices, a midsized semi conductor company; the ‘Analog Devices Balanced Scorecard’. Schneiderman’s design was similar to what is now recognized as a first generation BSC design. Kaplan and Norton have carried out some research studies and designed the concept of BSC and popularized it through publications of several articles and books on the subject. These articles and the books spread knowledge of the concept of BSC widely, and has led to Kaplan and Norton being seen as the creators of the concept. Design of a BSC consists of the identification of a small number of financial and non financial measures and attaching targets to them, so that when they are reviewed then it is possible to determine whether current performance is meeting the expectations or not. This alerts management to areas where performance deviates from expectations so that focused attention on these areas can be given for obtaining improved performance in those areas. The original thinking behind a BSC was for it to be focused on information relating to the implementation of a strategy, and over time there has been a blurring of the boundaries between conventional strategic planning and control activities and those required to design a BSC. This is illustrated well by the four steps required to design a BSC as given by Kaplan and Norton in initial stages of proposing the concept. These steps go far beyond the simple task of identifying a small number of financial and non-financial measures, but illustrate the requirement for whatever design process is used to fit within broader thinking about how the resulting BSC integrates with the wider process of management. Measurement is a key aspect of the BSC, but it is much more than just measurement. It is a means for setting and achieving the strategic goals and objectives for the organization. BSC has the following three critical characteristics. Since 1992 the capabilities of BSC are continuously being enhanced. Some of the advances which has been carried out are given below. There are three generations of BSC. The first generation of BSC used an approach which had four perspectives namely financial (e.g. revenue, expenses, net income, cash flow, and asset value etc. ), customer (e.g. customer satisfaction, customer retention, customer relationship. market share, and brand strength etc. ), internal business process (e.g. process control, quality control, yields, inventory control, and resource management etc,), and learning and growth (e.g. knowledge management, employee satisfaction, employee skills, employee turnover, and employee education etc.). These perspectives are shown in Fig 1. These perspectives are considered to be necessary for the management to plan, implement, and achieve the organizational strategies as well as for performance measurement. The four perspectives are measured, analyzed, and improved together in a continuous manner in order to ensure that the organizational goals and objectives are met. 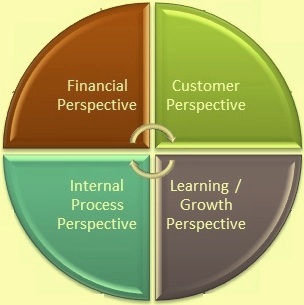 Organizational strategies are to be developed for improvement of these four perspectives together. If any one of these four perspectives are ignored then the organization loses the balance and obstacles get created in the path of meeting the organizational goal and objectives. First generation BSC is hard to design in a way that builds confidence that it is well designed. Because of this, many BSCs are abandoned soon after completion. Although less common, these early-style BSCs are still being designed and used today. In the second generation measures are selected based on a set of strategic objectives plotted on a strategic linkage model or strategy map. With this modified approach, the strategic objectives are distributed across the four measurement perspectives, so as to ‘connect the dots’ to form a visual presentation of strategy and measures. Use of strategy linkage model highlights on the value of visually documenting the links between measures. In this modified version of BSC design, management selects a few strategic objectives within each of the perspectives, and then define the cause-effect chain among these objectives by drawing links between them to create the strategic linkage model. A BSC of strategic performance measures is then derived directly by selecting one or two measures for each strategic objectives. This type of approach provides greater contextual justification for the measures chosen, and is generally easier for the management to work through. Problem with the second generation design approach is that the plotting of causal links among twenty or so medium term strategic goals is still a relatively abstract activity. In practice it ignores the fact that opportunities to intervene and to influence strategic goals are, and need to be, anchored in current and real management activity. Also the need to ‘roll forward’ and test the impact of these goals requires the creation of an additional design instrument namely the vision statement. During the implementation of second generation of BSCs it has been noticed that if a vision statement is created at the beginning of the design process, then it is easier to select strategic activity and outcome objectives to respond to it. Measures and targets can then be selected to track the achievement of these objectives. Design methods that incorporate a vision statement or equivalent represent a tangibly different design approach to those that went before, and have been proposed as representing the third generation design method for BSCs. Third generation refined second generation to give more relevance and functionality to strategic objectives. The major difference with the second generation is the incorporation of vision statement. Other key components are strategic objectives, strategic linkage model and perspectives, measures and initiative. In this generation the focus of attention among thought leaders has moved from the design of BSC itself, towards the use of BSC as a focal point within a more comprehensive strategic management system. For implementation of BSC to succeed in an organization it is necessary that top management is not only committed to the process but also demonstrates their leadership qualities in the implementation. BSC fails to produce results when the purpose for introducing it is not for effective strategy execution, but for more tactical reasons, such as to change the compensation system, to reinforce a quality management system, or to change the reporting system to give managers more access to information about their operations etc. All of these objectives are good but none, by itself, can transform and align an organization for effective strategy execution, the principal deliverable, as it turned out, for BSC implementations.